Tell us about yourself: One GSD trained in PPD. Looking at getting a dutchies when current dog retires. As I am only researching the breed I don't know the people and politics. Not sure how things are in DS world, my experience is GSD. In GSD world the biggest, brightest kennels with all the famous name sires are the people I avoid. My support goes to breeders that title their own dogs and only have as many breeding stock as they can work themselves and have lifetime return policy. So who should I be suspicious of in DS breeding anywhere in the world. I can honestly say now that you mention it, I don't know anyone stateside selling DS pups specifically from titled dogs unless they imported the parents. Nearly all DS come from working lines and you should be able to see the titles going back several generations since nearly 90% or more will have KNPV titles. I would however ask to see the parents linked on the Pedigree Database to see exactly what is in the lines. Avoid anyone selling dogs that can't offer at the very least, lineage going back five to seven generations or more. If you can get a pup from actual KNPV or PSA titled parents- that would be great. Example,here's one of my dogs below and you can see going back several generations that nearly all the dogs are KNPV titled. My dog primarily is doing obedience and protection work now- I'm not a trainer so I imagine he'd be titled if I was but I'm learning. I got Riddick from Land of Oz K9 which I think is part of Midwest Working Dogs. I have two dogs through Land of Oz and one dog through Mace's Malinois. there isnt a specific list of who to avoid but you should ask what you SHOULD be looking for in a breeder. There are plenty of shoddy DS breeders out there. In the US, Aachen and 4 bar D are the two I would avoid. There are others. 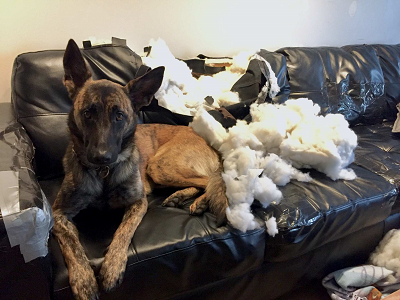 Most of Miami and Texas and Chicago are a dumping ground for poorly bred DS and malinois (with the exception of Judith/7 Pines in Texas). There are plenty of US breeders titling their breeding dogs, the studs a whole lot. I'm not sure why that would be so hard for Mark to find even 1. If titles and versatility are what you want Asheley (sorry I can't remember her new last name) with Vrijheid has nice dogs in her program. Probably the most titled in the bitesports per dog. There are plenty of other breeders too. The easiest thing to look up would be the Dutch Shepherd National Breed Club (the UKC one) or the Working Dutch Shepherd Association. Look at the members and lists of titled dogs. Look for common kennel names with dogs titled in the sports you're after. Some other things to look out for... No OFA or PennHip clearances or those with hidden clearances for dogs in the database. DS/GSD crosses or DS/Malinois crosses where the breeder is not actively producing for departments or their own training program and doesn't have a need or reason for the cross and is just adding DS to their fawn dogs because they want more money. If you have a list of breeders for future reference who have dogs titled in PSA and breeding them, I'd be of interest. Thanks comments, I regret the thread title cos it sounds negative. I think good breeding principles transcend breed. It is so easy to just breed dogs that it seems to attract a lot of dubious people. Personally I have been very lucky but too many I know have been burned. I will start files on lines and breeders. I don't like breeders that continually buy famous name dogs to keep titles up close but never title any of the pups they breed. I prefer lesser dogs that are at least 3 generations of the breeders own kennel name that have been titled by the breeder. I will also get to know the breeder personally , look at the condition of the dogs and what training they do. If they have more dogs than they can work I will pass. Also want to see how retired dogs are treated and the after sales service. I wish I knew more about the various dog titles but have been learning what I can. Mark77 wrote: If you have a list of breeders for future reference who have dogs titled in PSA and breeding them, I'd be of interest. If you're specifically looking for PSA, Christie (Northwoods/Thunderhawk) has titled dogs. She's also a PSA judge, although they do a lot more detection stuff and breed for their own program.